Summary: The classic fairy tale Rumpelstiltskin is given a Spanish twist. Senora Gonzales brags that her daughter Rosalia can make tortillas light enough to float. When wealthy Don Ignacio challenges her to come make some for him, Rosalia fears she’s in trouble. She gets to work, hoping for the best, but her tortillas don’t float. Just when she is about to despair, a strange little man dressed in rattlesnake skins pops out of the oven. 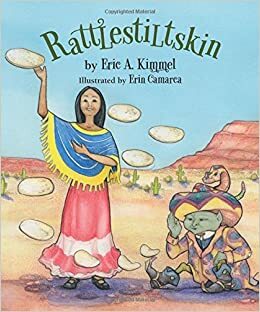 He gives her the secret for making floating tortillas in exchange for Rosalia’s promise that she’ll do anything he asks, then disappears back into his oven. Don Ignnacio is impressed enough to invite her to come live on the hacienda and cook for him. All is well for a while, but one day the little man reappears and demands that Rosalia comes to work as a maid for him and his friends. Just like in Rumpelstiltskin, the deal will be off if she can guess his name, and after two sets of three guesses, she manages to learn that his real name is Rattlestiltskin. She gets it in three the next day, Rattlestiltskin self-destructs, and Rosalia, Don Ignacio, and even Senora Gonzales live happily ever after. Includes a recipe for homemade tortillas. 32 pages; grades K-4. Pros: A fun compare and contrast with a classic retelling like Paul O. Zelinsky’s Rumpelstiltkin. The mood of this version is definitely lighter, and the Spanish setting , characters, and language add an interesting twist. Cons: I missed some of the ominous bizarreness that characterizes more tradition versions.